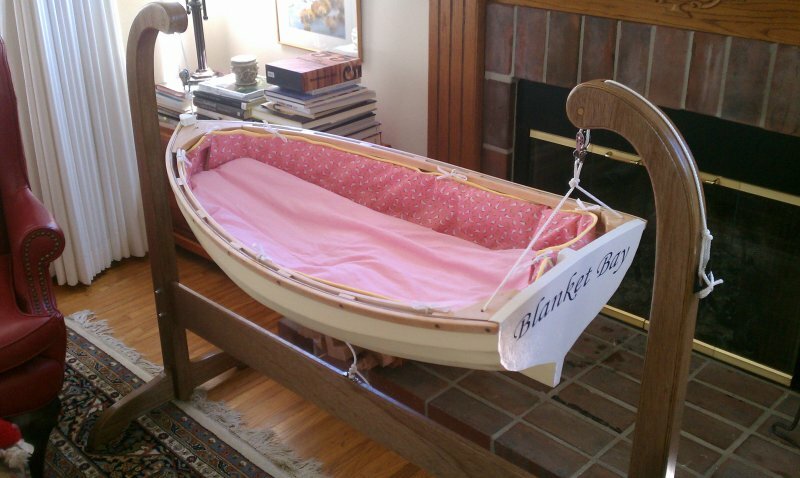 Blanket Bay was built for my granddaughter, born today, May 27th. I wanted a design that got the cradle up off the floor (my daughter has three little dogs) and this design fit the bill. It’s clinker built of 1088 Hydratec Meranti ply, with solid Maple gunwales. The plans call for copper rivets; I used glue and thickened glue instead. I painted her with non-toxic acrylic paint on the hull, raw linseed oil and beeswax on the gunwales. I hope Blanket Bay has many safe voyages.